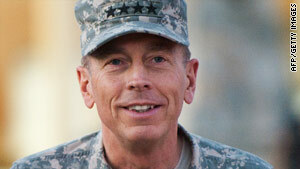 Gen. David Petraeus has spent a month on the job as commander in Afghanistan. Petraeus has said the date will mark "the beginning of a process"
Washington (CNN) -- One of the key goals of the new commander in Afghanistan, Gen. David Petraeus, is to try to settle the debate on the significance of the July 2011 date, according to an International Security Assistance Force official familiar with Petraeus' thinking. After a month in the job, during which he stayed mostly out of public view, the general is preparing a round of interviews with media outlets. July 2011 is the date President Barack Obama has set to begin reducing the number of U.S. troops in Afghanistan. But just what that will mean continues to be a question that the administration is struggling to answer clearly. Petraeus is expected to underscore the case that the July 2011 date is one that is not necessarily linked to a predetermined number of troops leaving. "He's taking a very pragmatic approach and understands that it's a year away, the full uplift isn't even on the ground yet, there are a range of issues outside ISAF control (mostly in governance) and that the enemy has a vote. He's not laying any groundwork -- we're just working hard at the mission given by the president," said the ISAF official. The issue of how many troops could be withdrawn and how quickly that could happen, continues to dog the Pentagon. "We keep going around and around and around on this, and the answer is the same as it's always been," Secretary of Defense Robert Gates said Wednesday. "We will begin thinning our troops in July of 2011. How many and how fast is going to depend on the situation on the ground." At his Senate confirmation hearing, Petraeus emphasized that the 2011 date is "the beginning of a process, not the date when the U.S. heads for the exits." He said the date is meant to put pressure on the Afghan government to step up and take responsibility, but emphasized the United States will be assisting Afghan forces. The United States and its NATO allies are expected to devote much of a November ministerial meeting to discussing various "metrics," or indicators of success, in Afghanistan, the official said. Those metrics will include: the number of trained and equipped Afghan security forces; security conditions in key districts; the ability of the Afghan government to provide basic services to its citizens; and other indicators of whether areas of the country can be turned over to Afghan control. "The more stable areas are the early candidates for transition," the official said, noting the first areas may be in north. The ministerial meeting will be followed by a report to Obama from his commanders in December about whether the overall counterinsurgency strategy is working. That December report will be instrumental in deciding how to proceed come July 2011.